The Flagstone Diamond Turf Block provides an environmentally sound alternative to solid paved surfaces. Our open grid design allows water and nutrients to penetrate the soil, feeding the ground and tree roots below. While this design is ideal for soil retention on sloped areas such as pond and lake banks, it is commonly used in wooded and natural landscape settings for both residential and commercial applications. 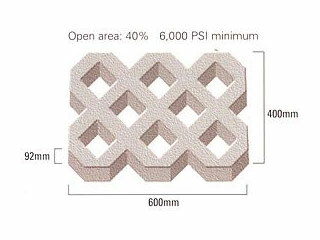 Because of its unique and high tensile strength design, it is the most durable block of its kind. The Flagstone Diamond Turf Block provides an environmentally friendly solution to parking problems without laying asphalt or pouring a concrete slab. Its unique design and 92mm thickness creates a strong, durable surface while allowing water penetration, reducing puddles and erosion. In areas where aesthetics are a concern, the Flagstone Diamond Turf Block is an excellent choice for parks, schools, golf courses and apartment complexes. The Flagstone Diamond Turf Block provides excellent soil erosion control on retention ponds, slopes, embankments, shorelines on ponds, rivers, creeks, and lakes.